These little treats (under 200 calories) are packed with good flavor, and you can enjoy them without too much guilt. 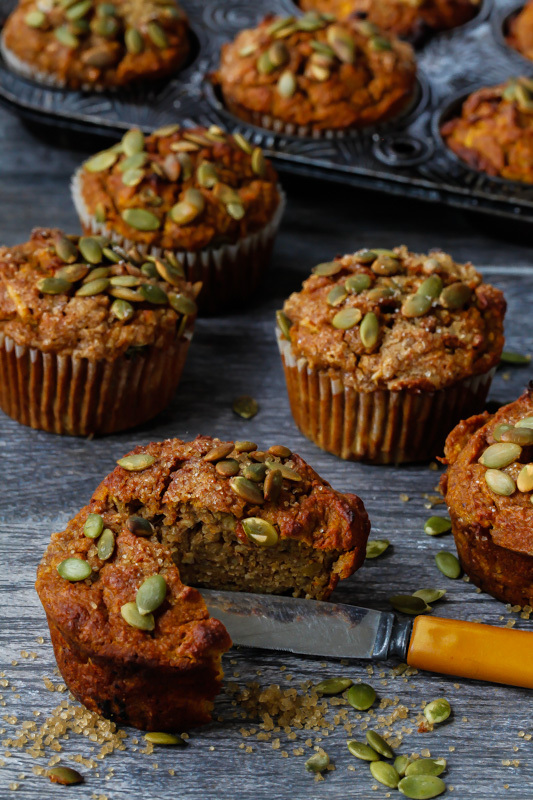 Pumpkin, grated apples, honey, and almond flour all contribute to making the texture of these spicy muffins very moist and tender. If you can’t find almond flour, you can grind almonds in a food processor until very fine. A little crunch and sparkle from pumpkin seeds and turbinado sugar add a festive touch. 1. Set the oven at 400 degrees. Butter a standard 12-cup muffin pan (or use muffin liners). 2. In a bowl, whisk the almond flour, whole wheat flour, baking powder, baking soda, salt, cinnamon, ginger, nutmeg, and cloves to blend them. 3. In another large bowl, whisk the eggs, pumpkin, honey, and oil until blended. With a rubber spatula, stir in the flour mixture until well blended. Fold in the apples. 4. With a 2 1/2 inch ice cream scoop or large spoon, divide the batter evenly among the 12 muffin cups (they will be full). Sprinkle each muffin with the pumpkin seeds and sugar. 5. Bake for 22 to 25 minutes or until a skewer inserted into the center of a muffin comes out clean. Turn out onto a wire rack to cool.